The Sudbury area has so many different lake and river systems to explore and this was going to mark another on the list. 3 of us were able to get the Friday off work and so we drove up after work on Thursday. On our drive in we saw a bear at a gas station about an hour from the launch, and also 2 moose walking down the final road we were driving in on. We pulled up to the parking at Metagamasi Lake around 2am in the morning where we had a quick beer before going to bed. The stars that night were absolutely amazing. We woke up early on Friday, as none of us are ever able to get a great sleep in our cars. We still like sleeping in our vehicles despite the poor sleep, as it saves us having to pack anything up in the morning. 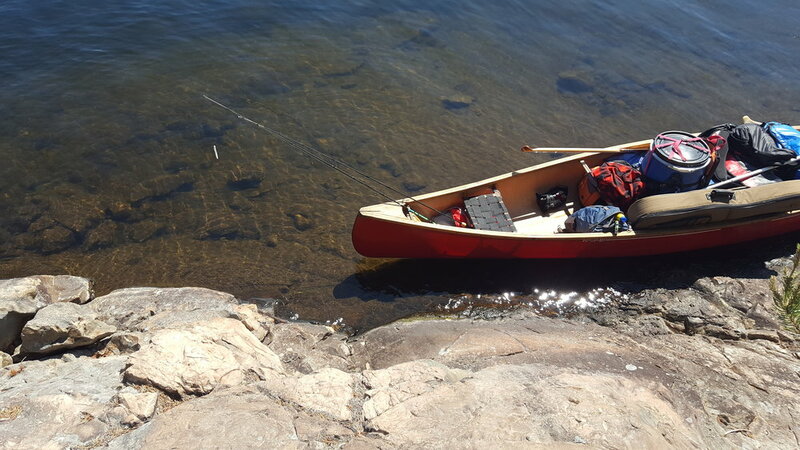 We quickly unloaded all our gear and packed up the canoe. Our goal for the day was to paddle a few km’s up Matagamasi Lake and camp at one of the sites along the left shore. The remainder of our group was coming up late Friday night and we were going to pick up in the dark and guide them to our site. It would be much easier for us to get them to the site having already done the paddle earlier in the day. We also had the GPS to tell us exactly where the site was that we had set up on. We arrived at our site around lunch and after setting up our tents, had a full day on our hands to have some fun. We spent a large portion of the day fishing and lounging around our site. We brought some extra beers in with us planning on dropping the empties off at the car when we picked up the rest of our crew later that night. I happened to catch a pickerel that day which we enjoyed in our soup. 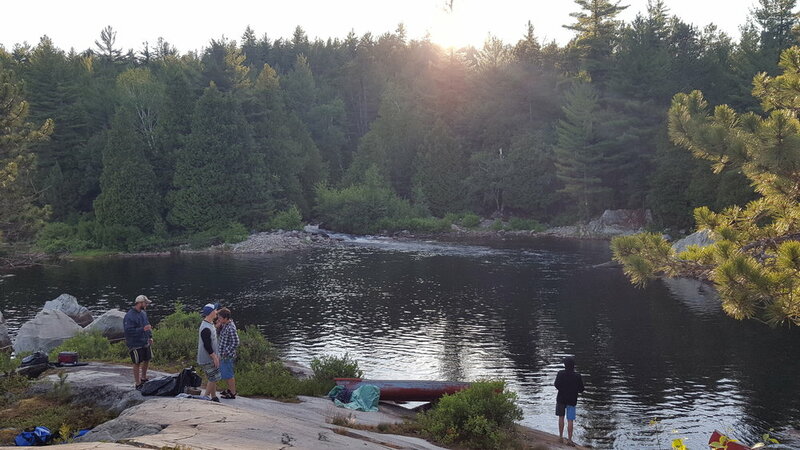 The rest of the group arrived at midnight and we got them all packed and did the approximately 3.5km paddle to our site in the dark. Having the GPS made this a much easier task. It is never a good feeling when you wake up in the morning and all you can hear is rain hitting your tent. It was tough to get everyone excited to pack their gear up while trying to keep everything dry. But you know how the story goes, get a cup of warm coffee and oatmeal into everyone and try to make light of the situation! After packing the canoes and setting off on the North Arm of the Chiniguchi River, the rain got worse. The group was not entirely prepared for this severe weather and most of the gear people had for rain, was so wet it became practically useless. Not only were our canoes filling with water but everyone was getting cold quickly. We pushed on nonetheless, knowing that we would be passing by the Paradise Lagoon that day. We are also getting quite good at laughing at unfortunate situations and finding comedic value in things that really aren’t funny. After the first 350m portage, the rain had let up and this section of the river was absolutely stunning. The water was crystal clear and had a blue tinge to it. We needed this kind of view after what we had just endured. 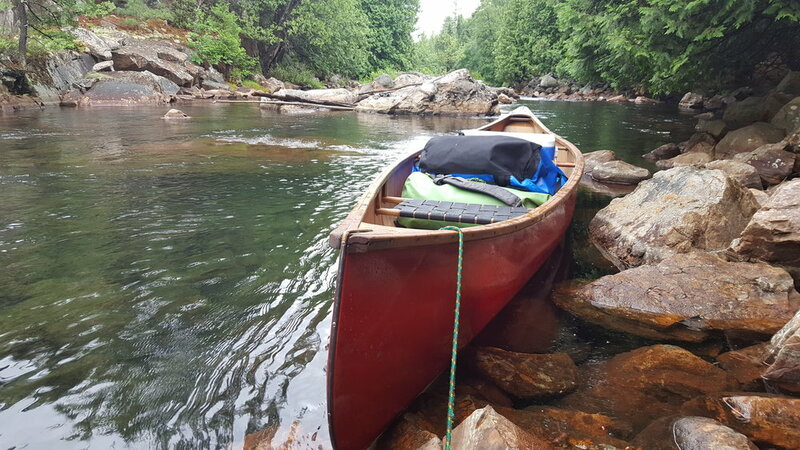 A short paddle down the river brought us through a small lake and up to our second portage, which was 360m. This was also the location of the Paradise Lagoon. As we started bringing our gear over the portage itself was quite elevated. It climbed straight up to a peak and straight back down to the next lake. The entire portage overlooked the beautiful river as well as multiple sections of rapids and waterfalls. At the very peak of this portage, there was a large group that had decided to camp on the portage. While I envy the location that they had secured for themselves, they were not very courteous to leave a path for other canoeists to get by. We were portaging our gear under lines that they had put up and around tents that were on the path. This wasn’t making our lives any easier, and after the rain earlier that day, our tempers were wearing thin. After bringing all our gear over, it was time to hike part-way back on the portage to where the Paradise Lagoon was. 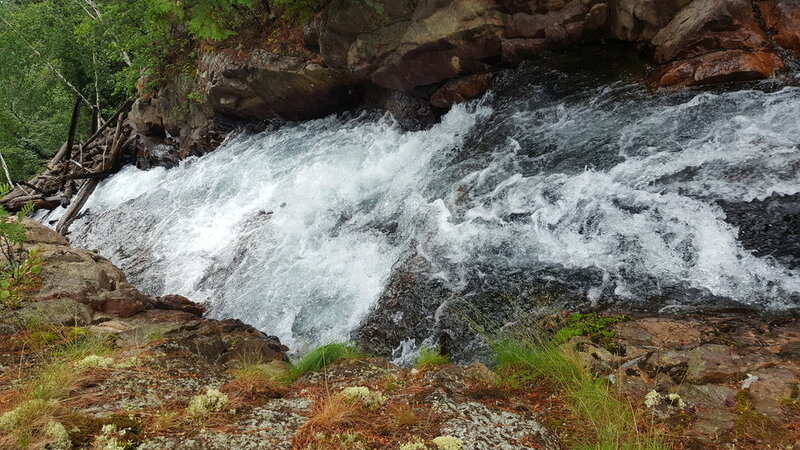 There was a strong set of rapids seen in the video that we had to cross in order to get to the waterfall hidden from sight. There is a pond in the back where there is a beautiful waterfall and a great swimming area. We could have spent the entire day here if we had more time. 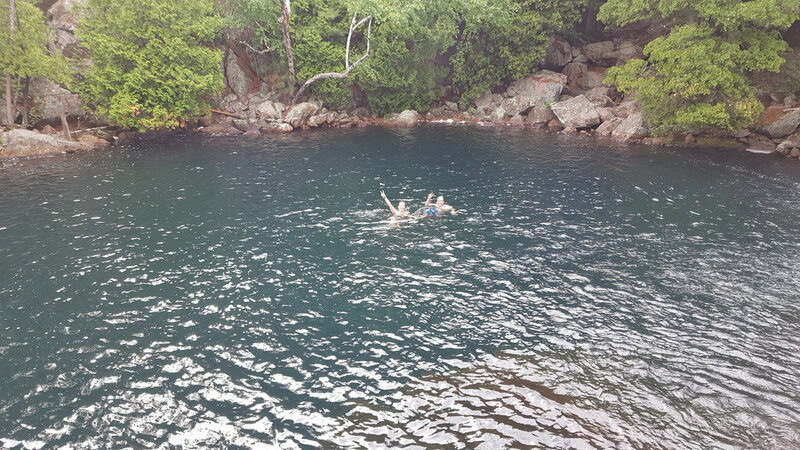 A few of us went for a swim while others relaxed on shore. At this point we were only 4km to the top of Wolf Lake where we secured the very last site closest to our third portage. It was a large rock face that had a fairly steep slope to it. There was 1 good pad to set up a tent and a second area that we make work. Managing to setup all 3 of our tents. 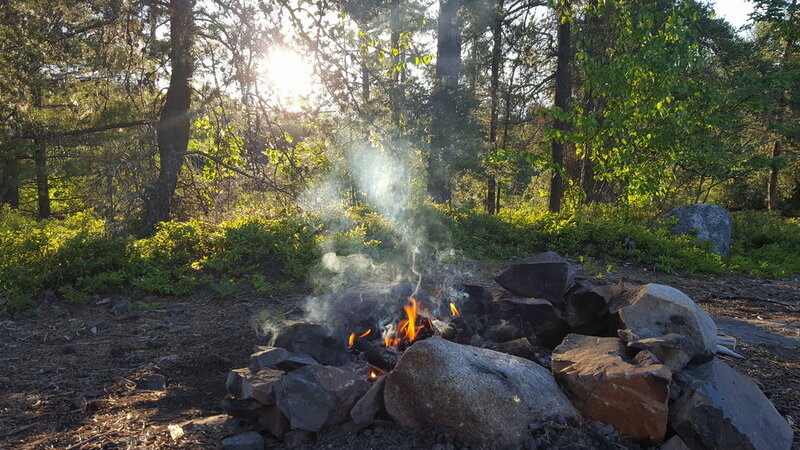 There was also a great spot to have a fire that night. Wolf Lake may sound familiar to some people and that is because the lake itself is iconic and has some history to it. What is the history you ask? Does the phrase “Save Wolf Lake” ring a bell? If not, the story here is that Wolf Lake is surrounded by the world’s largest known contiguous ancient red pine forest. The old-growth red pines are part of a critically endangered ecosystem that is estimated to remain on only 1.2% of its original range. If you are interested in reading more about this you can find it here. Waking up to a beautiful sunny day was just how we wanted to start the day. It even gave us a chance to dry a few of our items that had gotten wet in the rain. The first portage we had to tackle was in sight from our site (haha). 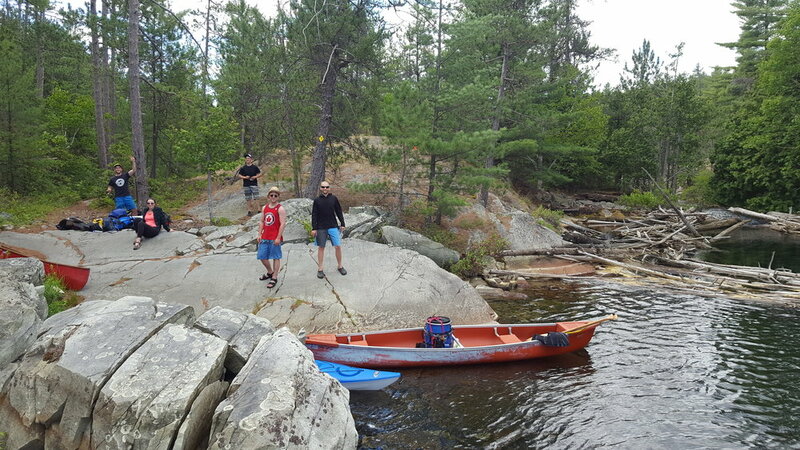 We didn’t bother packing the canoes too well since you could throw a stone and hit the portage from where we were. This portage was the fourth on our trip and was only 200m. After this we knew it was going to be heads down paddling for the next while. Dewdney Lake had an old abandoned Ranger Cabin on it. It was starting to fall apart quite a bit but was still intact. The walls on the inside were covered in carvings and signatures from other canoeists. It had a very eerie vibe being on the inside of it and was a really cool place to explore on our journey. We continued our paddle aiming to make it to one of the campsites on McConnell Bay knowing it was going to be about 15km from our location on Wolf Lake. 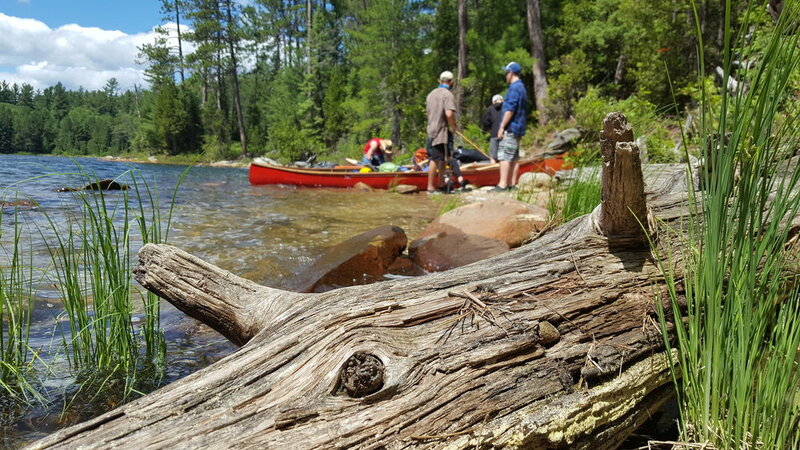 After a long paddle we finally made it into McConnell having to stop once to allow the crew to fuel up with lunch. The paddle was well worth it. The site we settled on had a beautiful beachfront that led into a forest with endless locations for a tent pad. This was a favourite site among many on our trip. Day 5: McConnell Bay to Wessel Lake: Who’s up for 8 portages? The weather was nice which helped quite a bit. We were under the impression that the portages from this point on were going to be less maintained, but didn’t really know what to expect. The map we had was poor and provided little detail as to where the first portage actually was. Pulling up along the shore there was an area that appeared to be where we needed to go. This was the first time there was no sign marking the portage. I was confident looking at my GPS and decided to tell the group to start lugging our gear along this trail. Well, it was a trail…for about 100m…and then it was more of what you might refer to as bushwhacking. Thick bushwhacking. It wasn’t until we were about 300m in or so that we all really questioned if this was the right way. Although I will say many members of the group had their doubts well before this point. Looking back at the GPS it was clear now that we were in the wrong place and on a day that was already going to be a long one, this was not helping us. It was not an easy trek back out to where the canoes were. Moving about 200m further along the lake we found the sign marking the actual 750m portage…oops my bad…apparently a better map would have come in handy. This portage started like many others, fairly clear with minor slopes along the trail. There were definitely more fallen trees but it was nothing too crazy. That is, until we got to the bog which we were not expecting. This was a section of deep mud that spanned about 150m. Over time people had placed logs and rocks in places to try and help you get across but none of them were very sturdy. Every single one of us had a moment where we fell in at least knee deep if not waist in some circumstances. You can see one of our friends struggling to catch his footing in the video. This was a real breaking point for our group. Spirits were low and people were starting to worry about the 7 other portages and if they were going to resemble anything like this one. While none of the other portages were quite as bad as the boggy one, none of them were easy. Each posed it own challenges. Many of the rivers that we paddled down this section of the trip were absolutely beautiful. There were some areas that you might be able to potentially skip portages if the water levels were high enough. There were some portages that had difficult put-ins and take-outs as the ground was deep mud that your foot would easily go through. This made it really difficult to load and unload our gear at each portage. There were a few spots along this route that proved to be great fishing locations. We caught quite a few Bass in our travels and some were very decently sized. By the time we got to Wessel Lake, the clouds were rolling in and our group was absolutely exhausted. We wanted to get to a site quickly to setup before the rain rolled in. We got a good tarp setup going and got all our stuff protected in the event the skies decided to let us have another good dump of rain. Good news was the rain did not hit nearly as hard as we expected and the night remained primarily overcast. The fishing that was on this lake was the best fishing we had experienced so far on the trip. 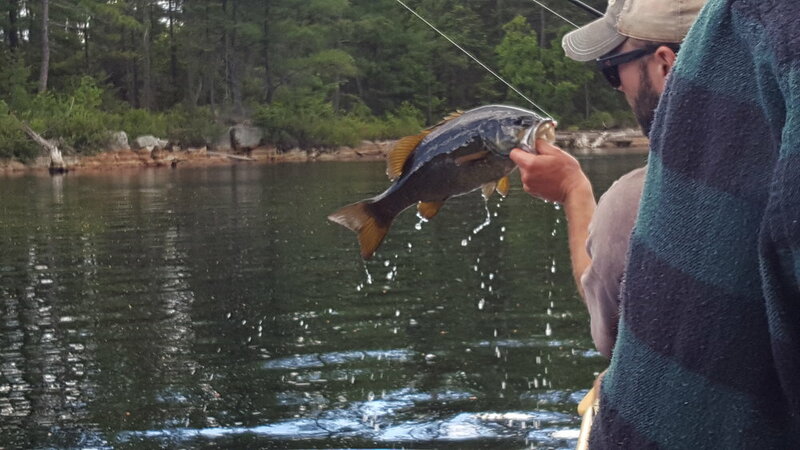 We were pulling bass out in large numbers and many of them were larger. While it didn’t rain, the bugs were out in full force. I had my headlight on and could barely see past the cloud of mosquitos and black flies. As you can imagine, the combination of bugs and pure exhaustion led to our group having a pretty early night. We all felt very accomplished after this day but I swear some of these friends of ours may never come on another trip with us. This was by far the best sunrise of the trip! The perfect amount of mist on the water and the lake was glass calm. We only had one portage to complete today and then a paddle back to launch through some larger bodies of water. We were very excited about potentially seeing some pictographs along a rock wall that we would be passing by on our journey. 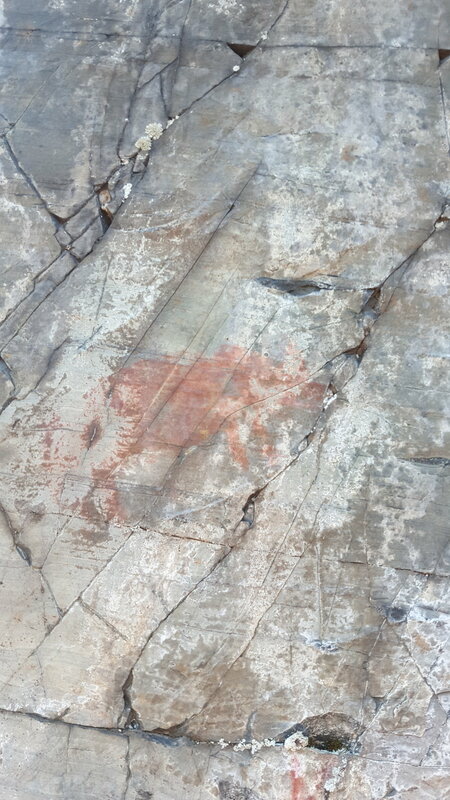 It took us a while once arriving where we believed the pictographs to be to actually find the markings. We have been told in the past that sometimes it takes a certain light to actually be able to see them well. The older they get the more difficult they are to see but we definitely were able to make out a few markings.